An indoor pool hot tub sauna central location free Wi-Fi airport shuttle welcome our guests at the pet-friendly AmericInn International Falls. This two-story property has 141 rooms all equipped with flat-panel cable TVs complimentary Wi-Fi and newspapers. Select accommodations have jetted tubs and non-smoking options are available. The hotel has a cozy lobby with fireplace and 24/7 computer station gym business center indoor pool sauna hot tub and game room. Parking and an airport shuttle are free of charge. Pets are permitted. AmericInn is located off Highway 71 neighboring Rainy River State Junior College. It is on the U.S. side of Rainy River with Canada across the water. There are a number of eateries less than one mile away. 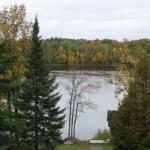 Voyageurs National Park Visitor Center on Rainy Lake is 10 minutes from the hotel and Falls Country Club is two miles. Falls International Airport is three miles.